EDT-Diamond dome inserts are two layered engineered products designed for high impact and wear resistant applications such as encountered in percussive drilling for oil and gas.Two layered structures have also found application in three cone rock bits.They are available in sizes suitable for both types of bits. 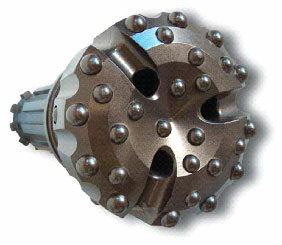 NOTE: The Diameter, Length and the Carbide Chamfer Machined to Customer Specifications. 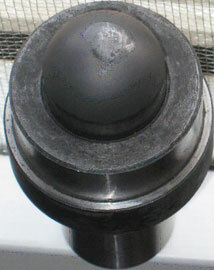 The Diameter, Length and the Carbide Chamfer Machined to Customer Specifications. Tolerance:D +/-.0003, L +/-.002.Products can be finished ground to meet customer’s OD and length specifications. Our 3/4 inch, and 7/8 inch dome inserts have found successful application in geographical locations ranging from West and East Texas, New Mexico, Oklahoma, Arkansas, WV and NEUS regions. Inserts are evaluated for their metallurgical features by microscopic examination of the section.Following micrographs show 1) the working layer integrity 2) the bonding between the working layer and the transition layer and 3) the interface integrity between transition layer and the carbide substrate.As can be seen in the following micrographs, the layers are homogenous and well bonded. 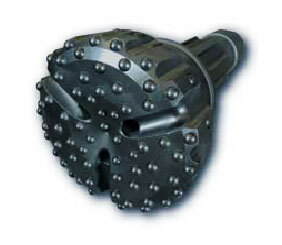 EDT-Diamond Hammer bit inserts are characterized by highest thickness of first layer than found in any competitive product in the market place.Typical thickness for the first layer is in excess of .045 inch and transition layer of .030 inch. 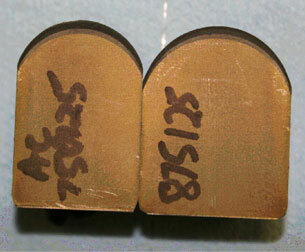 Photograph shows half cut view of both 3/4 inch insert (left) and 7/8 inch insert (right).Transition layer and first layer can be seen with layer thicknesses marked. 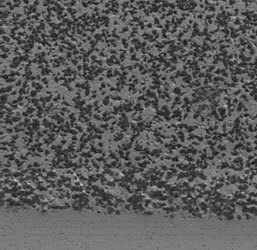 Scanning electron micrograph of outer working layer.The layer is more than 90% by volume diamond followed by a specially engineered transition layer that intimately bonds with the carbide substrate as shown below. 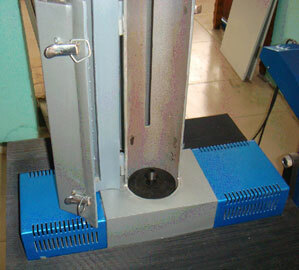 Impact Fatigue where inserts are subjected to impact at a rate of 20 hits per minute using a 5 Ton machine.